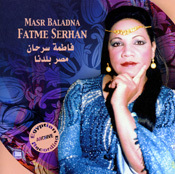 Fatme Serhan sings folkloric Fallahin and Baladi songs from Egypt. Her powerful voice, accompanied by an authentic ensemble is a true representation of traditional Egyptian musical culture. Badawiyya Bouy Badawiyya (6:07) Oh Bedouin! Aswan Ya Bab Al Nil (5:28) Oh Aswan, gate of the Nile! Ya Bint Al Masriya (7:23) Oh Egyptian girl!